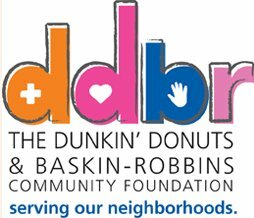 Dunkin' Donuts Baskin-Robbins Community Foundation Awards $5,000 to Support Long Island Cares Humanitarian Center in Huntington. January 28, 2015- Huntington, NY - The Mid-Atlantic Chapter of The Dunkin' Donuts & Baskin-Robbins Community Foundation (DDBRCF), comprised of local franchise owners and Dunkin' Brands corporate employees, has made a $5,000 grant to Long Island Cares, Inc.-The Harry Chapin Food Bank to support the food bank's newest location in Huntington Station. The focus of the DDBRCF is to serve neighborhoods by taking care of basic needs in the community- safety, hunger relief and children's health. Paule Pachter, Long Island Cares' CEO, expressed gratitude to the DDBRCF for their generosity. "We are grateful to Dunkin' Donuts for their recognition of the seriousness of the issue of hunger and for their support of our third satellite location, the Harry Chapin Food Bank and Humanitarian Center located in Huntington Station. This generous donation from Dunkin' Donuts Baskin-Robbins Community Foundation will go a long way in our efforts to battle hunger on Long Island, and most specifically in Huntington and surrounding communities. We are grateful to have them as such a valued community partner." The Mid-Atlantic chapter of The Dunkin' Donuts & Baskin-Robbins Community Foundation selected grant recipients based on the magnitude of the problem, the worthiness of the cause and the people it benefited. The DDBR Community Foundation has donated a total of $83,000 to Long Island Cares since 2011. Long Island Cares, Inc. - The Harry Chapin Food Bank is Long Island's first food bank: serving the hungry on Long Island since, 1980. Long Island Cares brings together all available resources for the benefit of the hungry on Long Island and provides emergency food where and when it is needed, and sponsors a wide variety of innovate direct service programs that help families achieve self-sufficiency. The organization was founded by the late singer, Grammy Award winning songwriter and social activist Harry Chapin in response to the growing issue of hunger on Long Island. It is continued today by his wife and partner Sandy Chapin, a dedicated Board of Directors and talented staff working out of their 35,000 square foot facility in Hauppauge and their storefront hunger assistance centers in Freeport, Huntington Station, and Lindenhurst. Long Island Cares is a member agency of the Food Bank Association of New York State and Feeding America. Long Island Cares, Inc. is recognized by the NYS Department of Health and the USDA as the regional food bank for Long Island. Subject: LongIsland.com - Your Name sent you Article details of "Dunkin' Donuts Baskin-Robbins Community Foundation Awards $5,000 to Support Long Island Cares Humanitarian Center in Huntington"